Downtown Syracuse. The Greenway is inviting. Relay practice. 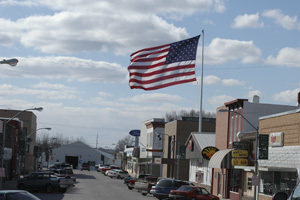 The town of Syracuse has used its strategic location between Nebraska City and Lincoln, and its service to the surrounding rural area, to maintain steady growth from 1880 through the twentieth century. One particularly distinguishing feature is the greenway and trail system, linking Downtown with major parks and the high school. It has all the basic services: restaurants, groceries, pharmacies, financial services, physician’s and chiropractic offices, gift and antique shops, and Realtors.